Meet this twenty-something coder whose quest for improvement is inspiring creators to find solutions to problems and fill a need. My name is Aya Jaff and I’m 21 years old. I was born in Iraq and grew up in Germany. My family and I fled home as refugees when I was young. Google Glass for the first time at Josephs Cafe in Nuremberg. Yes, I’ve had my fair share of hardships but actually that’s not what this story is all about. This story is about inspiring you to go after what you want in life even when it is hard. I hope it reminds you to be curious, think big and never let anyone tell you that you can’t do something you are passionate about. You might know me today as ‘Mrs. 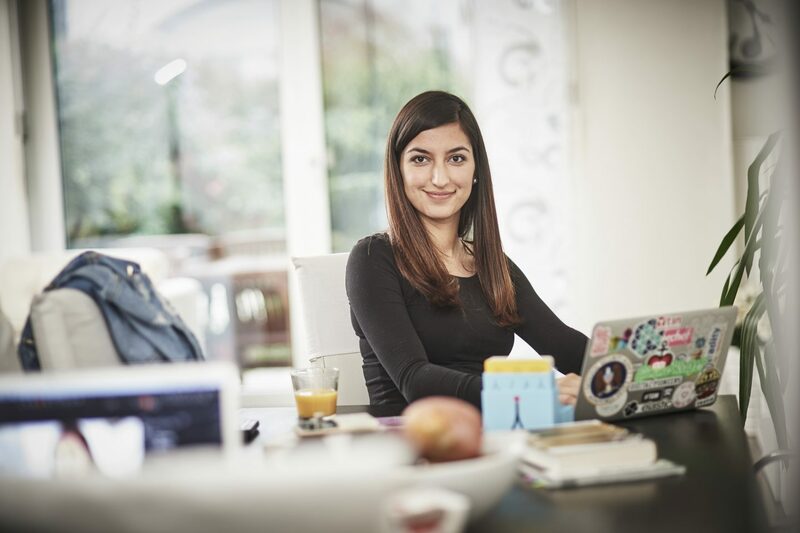 Code’, one of the most famous female coders in Germany. But what led me to where I am? Over the last years, I’ve experienced that technology knows no boundaries – all of us can participate and benefit from it. It’s also pushing us to be more creative and innovative. If this is the case, then why should I live in the confines of boundaries? Why should you? We are indeed living in exciting times. Being able to code has helped me tremendously in my life and career. Not only was I able to make my own ideas and dreams come true, I gained a lot of confidence every single time I walked on stage and talked about my work in front of an audience. There’s a really famous quote by Denis Waitley that inspires me whenever I start doubting myself: “It’s not what you are that holds you back, it’s what you think you are not.” That quote keeps me going. Now more than ever, your ‘crazy’ dreams are absolutely worth chasing. I hope by sharing how I’ve made a successful path for myself in the tech world that I can pump up that voice in your head reminding you to stop hesitating and jump square into the thing which inspires you. 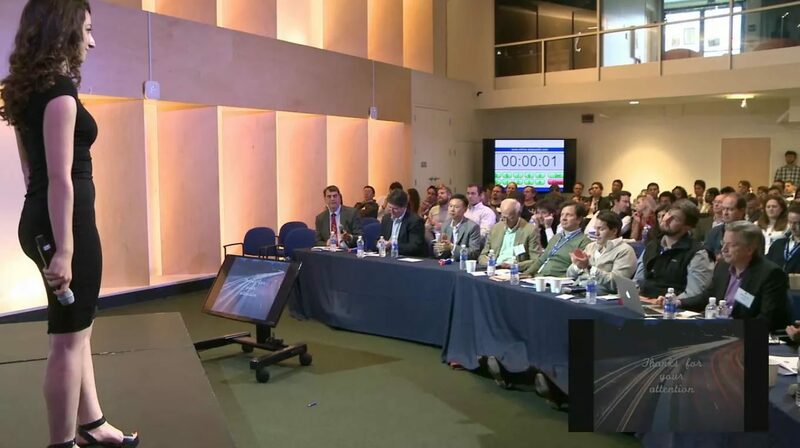 Presenting my project on Pitch Day at Draper University in front of 30+ Silicon Valley investors. Right after this pitch I got an offer to work for Hyperloop and happily accepted. At home doing what I love: programming, reading and studying Chinese. I can work anywhere - as long as I have my laptop and phone with me! Interestingly enough, I didn’t learn languages like Ruby, C or Java in school or at home. I’m self-taught. It all started when I was about 15 years old and wanted to digitalize our school calendar so I would know what classes I had a day in advance. I was quickly told that creating an app like that would cost me a fortune, and I did not have a lot of money. I used to read Forbes and Fortune Magazine in my spare time. In fact, my walls were plastered with dozens of Fortune covers and pictures of successful CEOs that I looked up to. You would find Sheryl Sandberg, Bill Gates and Marissa Mayer next to my bed or my table. Having women to look up to was especially helpful for me back in the day. I felt like anything was possible. So naturally I researched how and why these CEOs became so immensely successful and found myself drawn to the topic of finance. Soon I got to know a couple of high-school graduates that were working on a stock market simulation game for young people who wanted to learn how to trade. The project was called Tradity and I became their CTO for a few years. 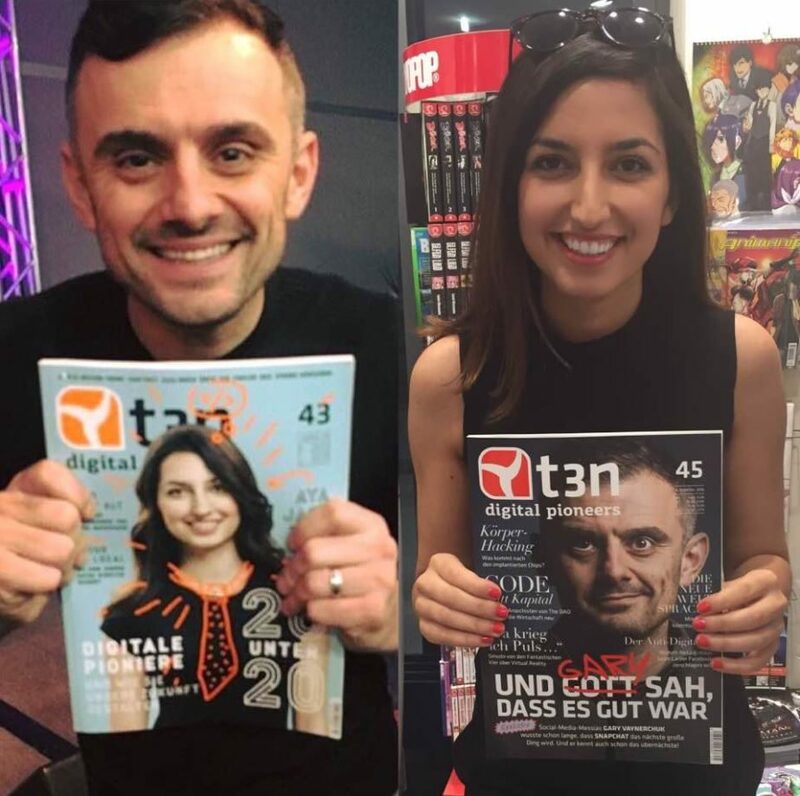 In good hands: Gary Vaynerchuk holding a copy of my T3N cover! Well of course, I had to reciprocate. 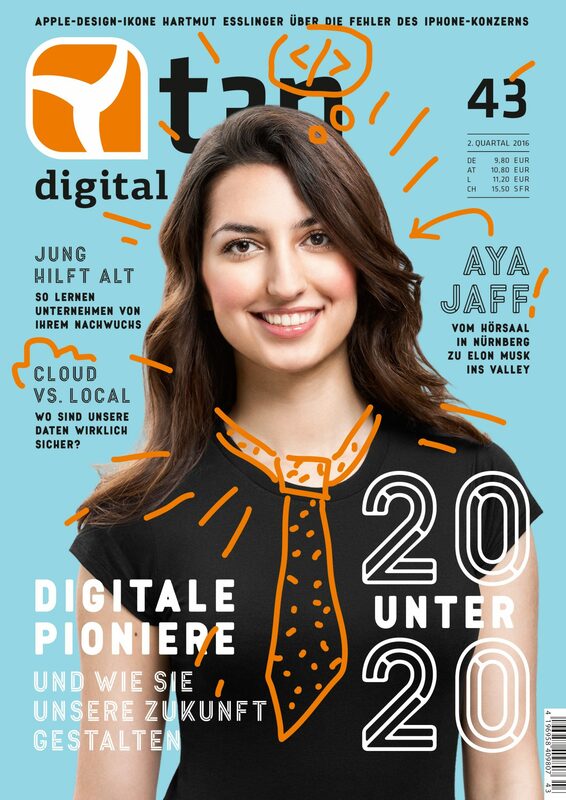 Honored to be on the cover and in the prestigious list of T3N’s “20 under 20”! Exceptionally happy about this as it’s my favorite magazine and one of the most popular in Germany’s tech world. As I grew older I realized that none of my female friends were interested in tech or finance-related topics. Of course they were supportive, but nonetheless, I was the nerdy one in the group. The only girl at tech meetups, part of the 10% of female coders at tech conferences. I couldn’t help but wonder… why didn’t these women engage in these topics? There are an array of scholarship and funding opportunities when it comes to education and conferences. So, what is stopping them? The way we look at women in tech, be it in movies, TV or even in books, is problematic. Women can’t seem to shake off the picture of being boyish, nerdy, bossy or ugly whenever they have something to do with tech. This could be leading many young girls to steer clear. But it’s important that we trail blaze straight through these misconceptions, one day at a time. That’s why I try to empower more women to learn about tech. They soon start to shed the false impressions and see that there is so much potential to create and grow. If there’s even just one more woman at the table creating and developing, we have a more holistic view and make better products. For example, back when Siri’s (the intelligent personal assistant from Apple) voice recognition was being developed, it worked much better with male voices because only men were testing out its functionality in the coding team. How crazy is that? 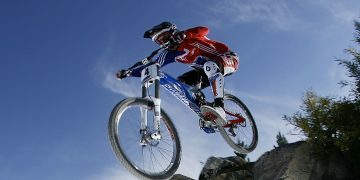 When we connect sport, fashion and tech topics, we can target both male and female interests. 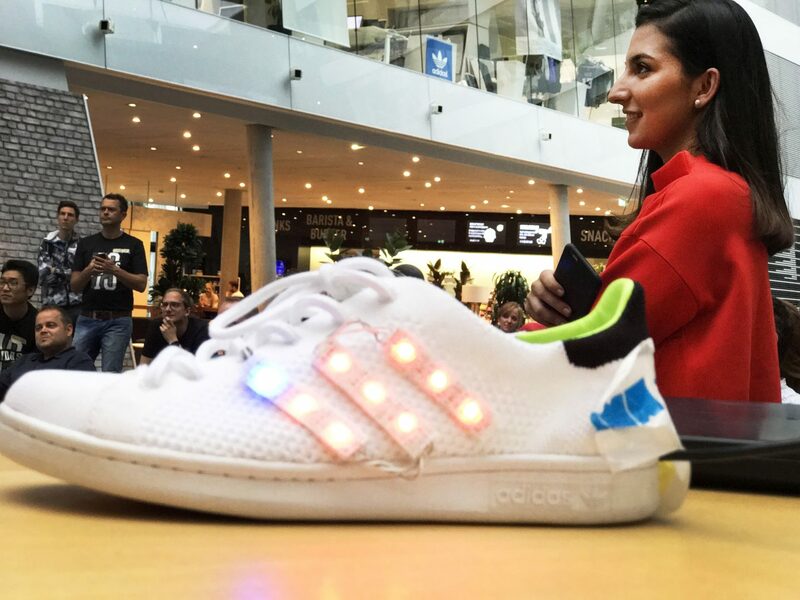 That’s the sweet spot that I wanted to explore at the recent #code4adidas event, which was a day-long innovation challenge where teams were asked to turn an adidas product into a ‘smart’ one using the Arduino platform. Opening the #code4adidas challenge with a review of the jam-packed agenda. 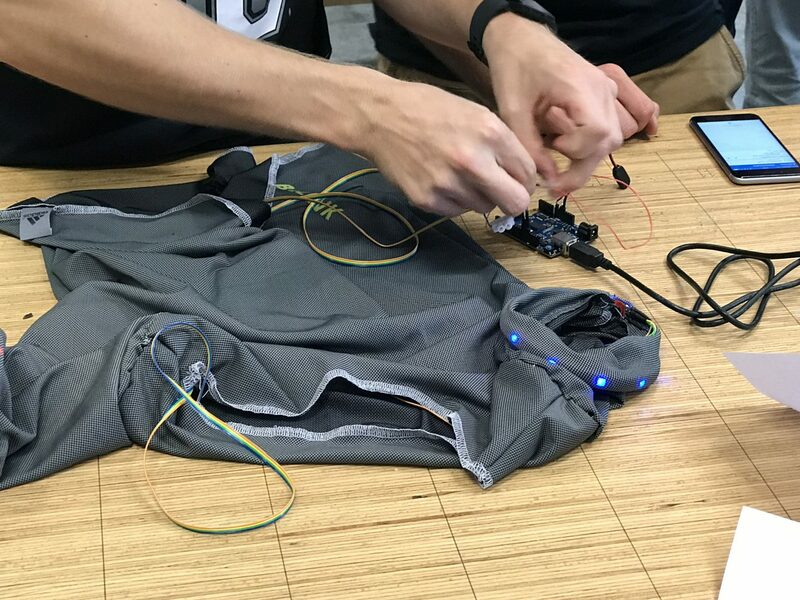 Wiring up a piece of apparel to make it smart. Just one of the many ideas to create a 2-way conversation between sportwear and the athlete. Our digital future is bright! The #code4adidas dream team. 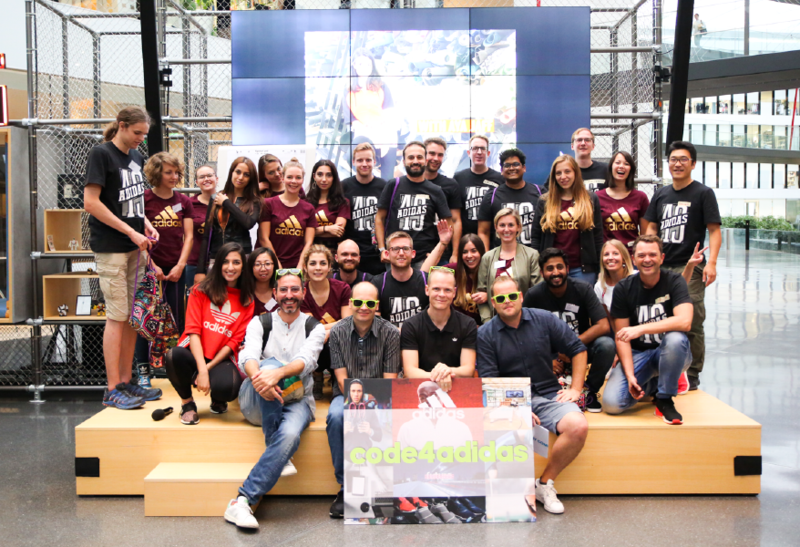 #code4adidas brought together creatives and coders to work together in teams at the MakerLab. They sketched out different ideas. There were no limits on experimentation. I could serve as a mentor and give them feedback along the way. At the end of the day, we even got a little help from the Arduino founder himself, Massimo Banzi! I’m thankful that adidas was so open-minded about co-creating this event. It was truly one of the best days of my life and I look forward to our next co-creation project. 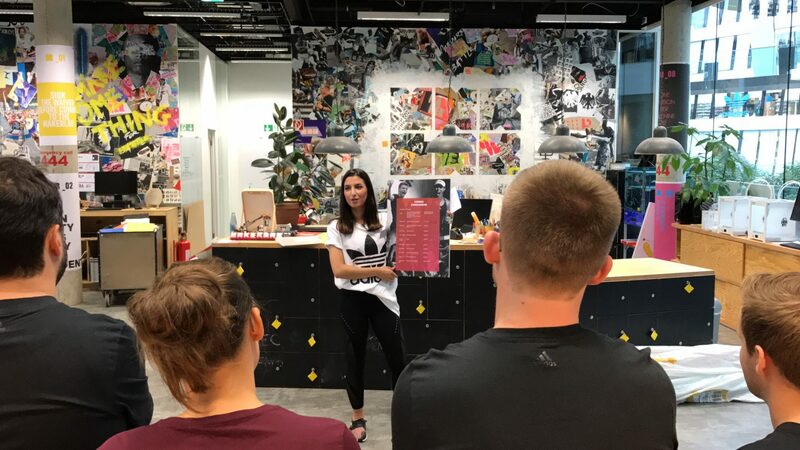 I saw firsthand that adidas is the place to work for those interested in living out an eclectic passion for sports, fashion and technology in their career. Get a feel for this special event here in our recap video! Ask the question – how can I bring value? While others may be boasting about past wins or vying for position, what the world really needs now are passionate problem-solvers. Look to improve every day, find solutions to problems and fill a need. It can be practical or grandiose, but the goal is for you to bring your unique value! I’m always looking for new ways to solve problems that I’m passionate about. Currently I’m working on a book called ‘Moneymakers’ which is a guide for young people who want to learn how to trade stocks online. At the heart of this book, my goal is to simplify a complex thing. I saw that many people my age were lacking knowledge or confidence around how to take care of their finances and/or how to invest for the future. So, I decided to dive into the topic myself and create a guide that would appeal to my generation, empowering them to learn how to create wealth. Stay tuned – it will be published next January! So, I want to encourage you – thought leaders, rebels, nerds, fashionistas and designers out there – look around you – at the things you love to do – and ask yourself “How can I make things better?” Your quest for improvement will open doors you never saw before and will give you the confidence to follow down a successful and meaningful path. How are you making things better? I’d love to hear your experiences in the comments below. 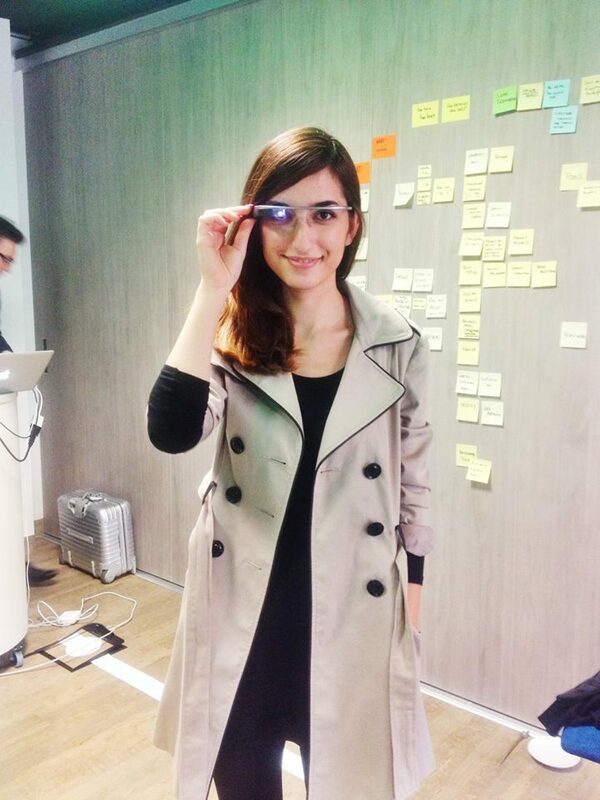 Thanks for sharing this great piece of inspiration and being a role model for women in tech, Aya. I can fully backup two statements based on my efforts for an innovation club at my company. First, boundaries are only set by ourselves. We often fear that we might not be allowed or fail to do something. I can't think of a single case where I went beyond boundaries of my role and experienced serious consequences. Second, language, gender and interests don't divide us. Diversity enabled solutions nobody on its own could have though of.